A long time ago, I obtained a degree in Psychology. While I never pursued work in that field, and opted instead for areas giving me greater personal freedom and less risk of falling into an area where there was danger of me controlling other people, becoming a professional art restorer and professional translator and editor to make a living, I have never abandoned my interest in all psychological phenomena, particularly those of a mass nature that are more readily classified as having sociological implications. I did most of my research based on my interest in finding a theory that would “explain” the apparently contradictory urge for personal liberty (individualism) and the need for being part of a mass (the theorised Crowd Instinct) in a post-industrial world based on transportation and communication by the combination of what I considered the best out of two schools of thought, that of Elias Canetti, (Crowds and Power) and that of Guy Debord and the other Situationists. I never quite found what I was looking for, but very often, I saw the paradigms of their viewpoints on crowd dynamics, which were about the power of persuasion to people who often were convinced they were acting independently, illustrated perfectly in religious cults and political movements, two areas that continue to interest me. When I was in University, there really weren’t many religious cults going around that I could identify clearly as such, but that energy (which Canetti and others describe as irresistible) would need to be directed someplace. Those were the days when New Age started to take a foothold in almost every place one could go. Being vegetarian, I guess I must have bumped into their world more often than most people do, as the practice of abstaining from meat is a frequent one in many New Age practices. My discount card at the vegetarian diner or food shop seemed to have put me on hundreds of mailing lists of all kinds. I resisted all the recruitment calls that were either blatant or veiled and I only took part in two events (a group hypnosis event, which I am still attempting to understand fully, and a drumming event, since I was a drummer and thought maybe I could learn something useful.) New Age carried a lot of the same features as any religious cult, such as the belief that its initiates were part of the creation of a New Society, while at the same time, increasing Personal, Individual Potential. Yet there is that little grey area that a sceptic, a rationalist such as I am would come to loggerheads with each and every time: the request to not really believe what you see and hear, but to believe in some kind of faith concept, often freely exchanged with various forms of Guruhood, hero-worship, deference to a “spiritual” or “political” head who was looking out for us, making great personal sacrifices, yet could SEE himself what we were still blinded to. Another feature is to reject facts, prior information or even information coming from other sources. In order to render this effective, you actually do need a group of people, including friends, to go along with it too. Recruitment (often for no other purpose than pure recruitment) has an element of a pyramid structure “con” to it which in today’s world of emails is a lot faster than it was in the 80s, and I would imagine, a lot more widespread. Although I do tend to believe that with the speed in which internet relationships are born and dissolved, it may not be as dangerous as it was in the past, since there is perhaps a more flippant attitude towards it. One may not even have to be a “true believer”, it’s enough to have your name added onto a “friends” list or a “mailing list” that will go into a market research kitty. In the end, gaining consensus seems to be little more than convincing someone that “everyone’s into it” so that the pinnacle of the pyramid feels himself entitled to act in the name of an enormous popular mandate. 1) a group leader that had “reserved information” and “high-level contacts”. In a word: clout and prestige that the seeker would need to tap into so that he or she could be released from ignorance. 2) a request that the seeker make some kind of commitment (economic, recruitment, active) to the purposes of the group. 3) the insistence that the group was not an end in itself, but that there was a higher purpose that would be achieved through it, often in escatological or apocalyptical terms. 4) slickness in the campaigning that demonstrates there is a large organisation behind it, perhaps a LOT of money, but not much disclosure of the organisation’s structure or finances. When it was disclosed, often the information could not be clearly verified and more often than not, one would find denials and contradictions with one Google search further. 5) insistence that there were going to be great changes ahead, either personal or collective and in some cases, global. Now, there are many very innocent groups and organisations that may have some or all of these characteristics, but there is one constant characteristic that a legitimate group would never have, and that is the insistence that we have to “believe them” and not objective information, information obtained through personal perception or through sources that we trust. To make a fear, a projection or an illusion into a case bigger than a reality that can be objectively verified is a common trend in these groups. They want us to feel urgency, panic, outrage about the same things they do, and they present numbers, figures and projections out of all meaningful parameters. While trying to help my friend, I got caught up in a few quite competent Cult Watch organs, many of them doing admirable work and only to be commended. I cried while reading some of the testimonies, of how people who only sought positive things, love, knowledge, peace, were denied their liberty, mental well being and critical tools. I thought, the day freedom comes to the Palestinian people, I will direct my energies to work towards these slaves of gurus, healers and charlatans. Then, I thought, it’s probably a bigger industry than even Zionism… I think I am out of my league here! One thing though, that did trouble me in these forums, sites, lists, was the lack of appearance of some groups that I believe are every bit as dangerous and deluded, and I mean a category of groups that to me are on the wild side of rational thought, the Christian Zionists. I didn’t see any areas in these sites that would include this branch of cults. Christian Zionism has a few purposes, the practical one is to keep (especially US) international policy favourable to a Jewish State in Palestine, and to do this would do anything possible and imaginable so as to have leaders in office that will always have as their priority to render this scenario possible. The Christian Zionists need this for their escatological goal, the battle of Armageddon to be fought in Israel, thus saving the souls of the Christian Zionists who will be raptured. It gives me the creeps to actually write about it, to think of the implications, but all religions contain elements of a final scenario, and I suppose Christian Zionism has abandoned the principles that made Jesus Christ into a univeralist model of love and forgiveness, and instead focus in on the final countdown, where they can be protagonists in the big war. The focus of Christian Zionism has a narcissistic element, combined with the violent one, that obviously will be reflected in any campaign they do. One group that has piqued my interest for a long time is CUFI, and I wrote about their big show “A Night to Honor Israel”. Here is another peice that shows their severe contradictions. I check them out from time to time, and this morning, I saw something that I think would be worthy of Cult watch, and that is, the campaign for a “Prayer Card for Israel”. Your prayers are critical during these difficult times. 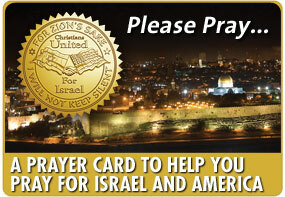 CUFI created a special prayer card to help you pray for Israel and the world. All of a sudden, America has become “the world”, but that’s just a little detail. Click further (they must get points for each click made, because you are forced to navigate for a while) and you come to the page where you request the “card”, needing to send them your name and email address. You get an email in less than a minute and you visit their site now from your email account, so they have your IP and NOW your email too. But, you are curious and you want to see this card so exclusive it has to be requested by email and you have to download a PDF, and damn the torpedoes! It hits you in the face with just that, there’s the image of a nuclear missile, a headshot of Ahmadinejad, writing in all caps: NOT ON OUR WATCH! And the tagline, Stand with one voice against the threats from Iran. Stand with Christians United for Israel. Thank you downloading the prayer card to help you pray for the peace of Jerusalem and the world. You will receive a link to download your prayer in your e-mail shortly. We want to provide this prayer card to millions of Christians around the world. We want to help every Christian pray for Israel and America. Please help us reach millions of Christians worldwide. Please fill out the information below to send the prayer card to your family and friends. Ah! the next step is the Pyramid one: you should send it around to friends. Hell, even your ENTIRE ADDRESS BOOK! Talk about obtaining a bunch of information for free!! Here is their text, misspellings and all – and note, the name of the text isn’t any longer “Israel prayer” but the hyperlink is “Iran prayer”, a classic bait and switch… but maybe it was about Iran the whole time? In order to send to more than 5 friends, please enter your email to recieve a copy of this message to forward to your entire address book. Please note that you can only list 5 friends at a time. If you want to send this to more than 5 friends please enter your email in the space above to receive a copy of this message to forward to your entire address book.. The threat from Iran is increasing with every day that passes. As Iran gets steadily closer to obtaining nuclear weapons, we get that much closer to the possibility of a second Holocaust. The risk that Israel and her six million Jews might be “wiped off the map” is too great for us to sit silently by as the world does nothing. Now is the time to combine fervent prayer with urgent action. We must pray that this threat to Israel and America will be removed. 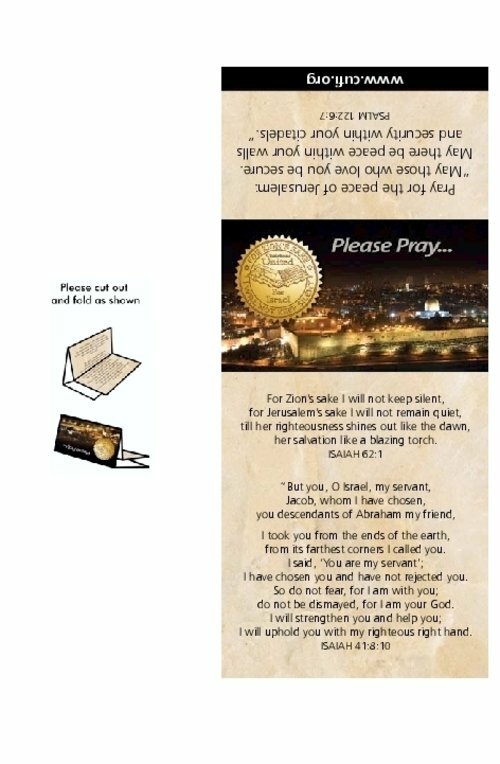 Christians United for Israel has created a prayer card with scriptures to beseech our Lord to protect Israel and the world in this trying time. Please click below to download this prayer card. Please pray for Israel and America. Please use the prayer card, and any other scriptures that are meaningful to you, to pray for the peace of Jerusalem and the world. Israel actually has nuclear weapons. We aren’t supposed to think about that. (This follows the criteria of a cult of expecting people to not believe actual facts, but to trust the leader and to agree that his “fear” should be shared by you too). Israel has actually bombed others in the past few weeks, a fact we are also supposed to ignore. The problem is Israel’s existential threat coming from … Iran. Well, this may be a nothing more than your average religious-political cult, but I believe that since they believe we should “pray” that this “THREAT TO ISRAEL AND AMERICA TO BE REMOVED”, convince others of this and give money, political consensus and … not a small matter … our mail contacts to them, since of course if they want to “read” the prayer, they have to fill out a form with their email address, etc., that this group may be just a bunch of Apocalyptic Messianic fanatics, they indeed should be monitored by anyone who not only sees a danger in the manipulation of facts to suit a limited and dangerous political agenda, as well as anyone who treasures privacy.